Beautifully enhance your lashes with the Clarins Supra Volume Mascara, a thickening and volumising mascara that intensifies every last lash. Designed to create long-lasting volume, the Supra Volume Mascara is enriched with panthenol and cassie flower wax, which help to nourish and strengthen the lashes for a naturally boosted look. Light and comfortable, the ultra-supple fibres hug every last lash, while its conical tip enables precise application. At the base of the lash, move the Supra Mascara wand in a zigzag motion for intensified volume. 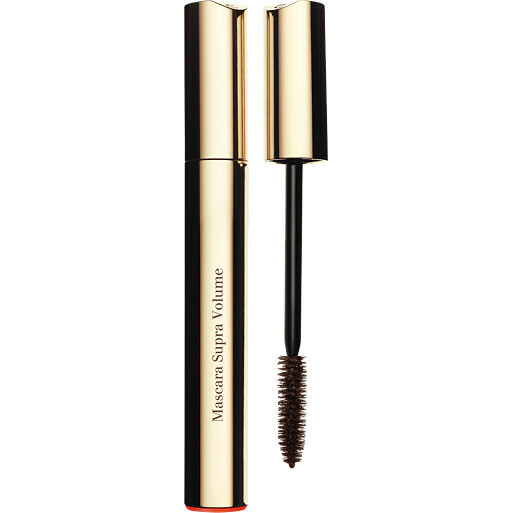 Clarins Supra Volume Mascara is rated 4.0 out of 5 by 3. Rated 5 out of 5 by Peaking from Best mascara ever used Although I got the brown finish it is just very slightly lighter than black, less dark and stark and perfect for blondes or anyone fair skinned, lovely waxy consistency so not too thick or too thin. Does not clump, even if you let it dry between recoats. I find it thickens and lengthens lashes extremely well, non smudging/flaking and yet very easy to remove. My new HG mascara! Rated 5 out of 5 by Kate91 from My favourite volumising mascara I’ve tried a bunch of mascaras and I’m normally not blown away by the pricier options. This one, however, has become my favourite. It makes my lashes look volumised without being clumpy and I’ve experienced no smudging or flaking at all. Easy to remove in the evening. Dries up a little quicker than I’d like but still managed to get 3 months good use from it. Love it.